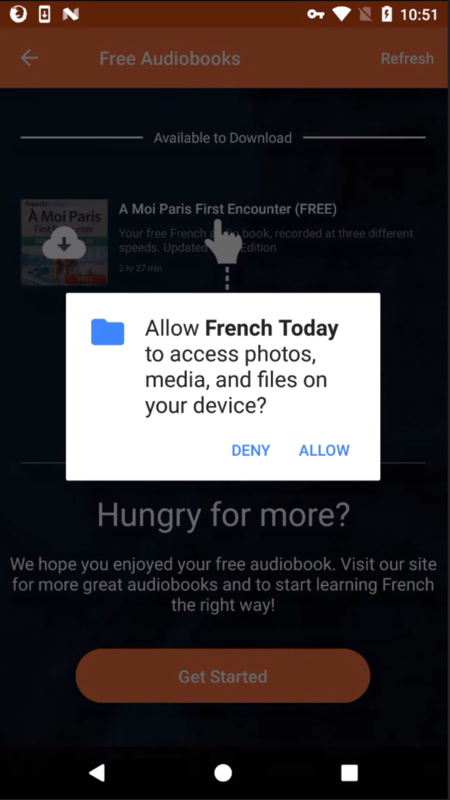 "Allow French Today to access photos, media, and files on your device"
In order for you to be able to access your audiobooks without being connected to the internet or without using any data, the French Today app will download all the audio and transcript files locally to your device. In order to do that, the Android system forces us to ask for user permission (which is a good thing to do). Without access to be able to save and later on access the audio and transcript, our app is non-functional. Why "Photos, Media, and Files"? Unfortunately, unlike on iPhone or iPad, the Android system does not have the functionality to limit an app to access JUST its own directory so it must ask for a generic permission that encompasses all read/write access. We promise that we ONLY use this power for good. The only thing our app does is save audio and epub files to your internal storage and then open those files when you want to read/listen to your audiobook. We don't access any other data, anywhere else on your system. We're sorry to hear that and we understand your caution. Unfortunately, the French Today app will not work if you don't. We recommend you download the MP3/PDF version of our audiobooks and then import the individual files to your Android device via any of your preferred media player app (which they themselves would need permission to access your files). You will lose access to all our great app functionalities but you'll still be able to access the audiobooks, or you could contact us and request a refund.